Find center of whole hip, move point forward three-quarter inch; at bottom, find one-half remainder of bottom line after taking panel off. Connect these points with straight line, continuing to waist line. Fig. 5 shows method of allowing for high waist line, drawing lines straight up from waist line unless more than two inches, when they should curve out slightly to allow for size of figure. Take one-quarter inch from front edge of tuck at top and run to nothing at hip line. This keeps edge of tuck straight. Dotted line in center of tuck allowance at top and bottom marks line for fold of tuck. Fig. 54. 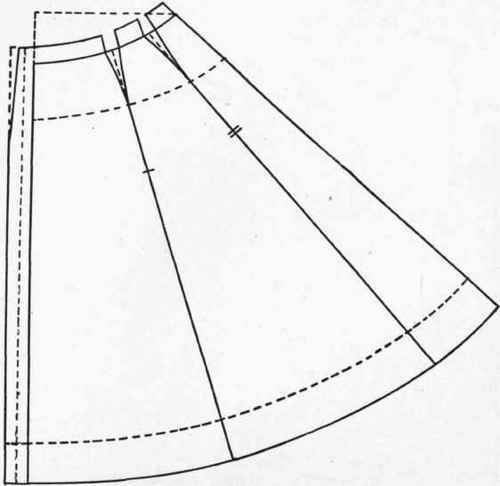 - Five-gored skirt pattern, panel back, two side- and two front-gores, developed from a circular foundation skirt pattern. Remove fulness at waist from front of panel, back of side gore and the balance from hip seam. Mark guide lines for joining seams; place pattern on material as follows: center front on selvedge allowing for tuck, front of side gore on lengthwise thread, and center of back on lengthwise fold. Mark as far from floor as desired. 2. Petticoat (Fig. 55). - Panel front, two side gores and two narrow back gores. Four or six gores are sometimes used. Fig. 55. - Five-gore skirt pattern, panel front, two side- and two back-gores, developed from circular foundation skirt pattern (petticoat). 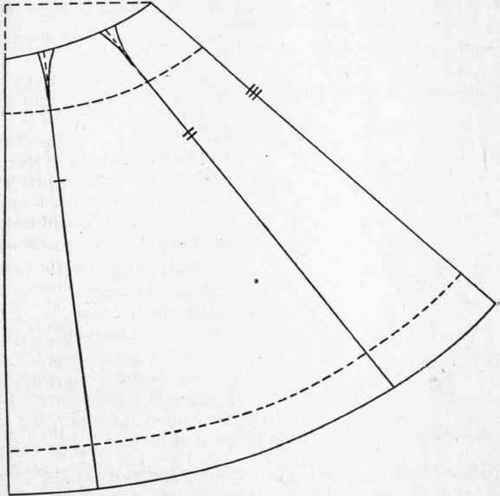 Draft circular skirt in usual way. Gore Divisions: Front Panel. - Measure from center front on hip line one-tenth of hip measure, and at the bottom twice the measurement at the hip. Measure from center back, one-eighth the hip measure on hip line, and twice this amount at the bottom. Remainder after panel and back gore are taken off. 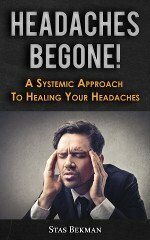 Take extra fulness from front of back gore, both sides of side gore, and back of front gore.